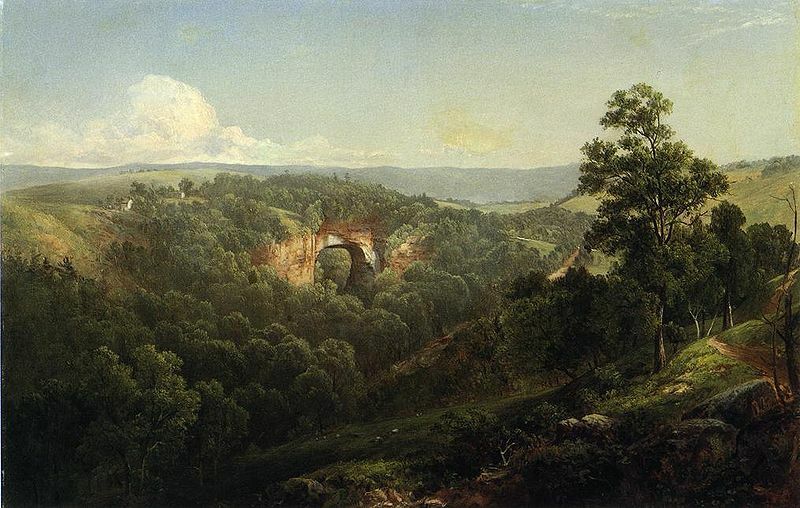 Natural Bridge as painted by David Johnson in 1860. I had a fantastic day’s drive this first day of my journey on the Blue Ridge Parkway, despite one big disappointment. 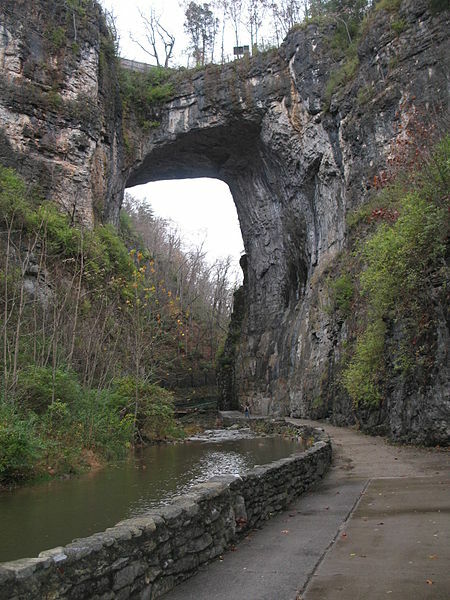 In my perusal of sights along the parkway, I had seen pictures of Natural Bridge and wanted to see it for myself. I didn’t know it was a tourist trap. The entrance to the bridge was on the inside of a gift shop, and a walk down to see it would cost me $20. The cost of the ticket included some extras, but all I wanted was to see Mother Nature’s creation in a natural setting. When I saw the crowds, and realized the setting would be staged, I passed. Instead, I back-tracked to Yogi Bear’s Jellystone Natural Bridge Campground, where I had reservations, and checked in early. I like the family atmosphere of Yogi’s campgrounds — and the 50 percent discount I got from this one as a Passport America member. After hooking up, I had plenty of time to take Pepper for a nice walk down to the James River, which ran along one edge of the park. I had the river to myself, and sat for a while beside it at a picnic table watching Pepper chase fall leaves. Book Report: Travels with Maggie is now up to 58,302 words. Bean’s Pat: Discovering Myself http://tinyurl.com/9kfpuuk I’ve been traveling through fantastic fall color country. But this blogger has some fantastic shots of Minnesota’s fall colors. Take a look. I have never been. Looks gorgeous! I discovered my first Yogi’s in Canada. I’ve been fond of them ever since Thanks for the kind words. Thanks Katrinamillen. I can’t take any credit except for coming across it and then sharing.